When Misao Jo was 57 years old, she built a loom, and started weaving as a hobby. 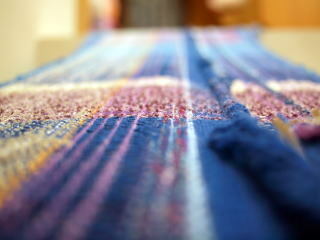 One day, she wove an “Obi” (a belt for Japanese Kimono), and found a warp thread was missing. But she thought it was making a good effect, and she was very pleased to find that a nice pattern had been formed by an accident. She showed the “Obi” to a person who was running a weaving factory in her neighborhood because she wanted to know how other people would value her weaving. The man told her that her “Obi” was “flawed” and it would be worthless as a commercial product because one warp thread was missing. Misao realized that a commercial factory is only eager to produce a “flawless”cloth, but she would be able to achieve a hand woven quality through intentionally making a “flawed” cloth. She built a new loom with her third son, Kenzo, to put her idea into practice. She wove many items and gave them to her friends who were very grateful for it, and her friends soon became very eager to learn how to weave. Misao named her weaving method “SAORI” and started her career as a weaving teacher. She started teaching with 5 students. In her first lesson, she showed them how to warp the loom, and assisted them in each step of preparation. Then she told them to weave as they liked and advised that they should try not to weave a cloth that looked machine-made. To her surprise, soon the students started to weave beautiful works. 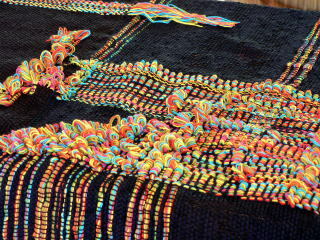 The talents hidden inside them were uncovered through weaving. Through this experience she was convinced that anyone had a power of creativity, and if given the chance, anyone could bring out their hidden ability and demonstrate it in their works. The conventional way of teaching practiced in traditional lessons such as “Ikebana” (flower arrangement) or doll making had forced the students to follow the teacher’s instructions or copy a sample. This was what had prevented the people from expressing individuality and discovering their abilities hidden inside. So she decided to follow the following process. She would just teach her students the basic techniques of using a loom, and helped them remove their stereotypical preconceptions of weaving. But once the students mastered the basic technique, she would just let them weave what they liked. She would give them some suggestions and see how they would react, but would never make further intervention. This gave the weavers an opportunity to discover their true selves, and eventually gave a pleasure to both weavers and herself..